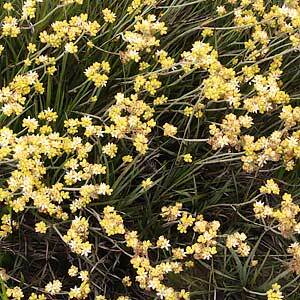 Attractive yellow flowers on a clumping perennial make Conostylis aculeata an interesting ground cover plant. Best described as a perennial tufted or clumping grass like all of the genus it is from Western Australia however will grow well in the eastern states. Drought tolerant and low care, this is a species that can be used in the garden border or grown in containers. Unlike some other Conostylis species, the flowers of this species are held on stems above the foliage. The grass like foliage is a mid green and the bright yellow flowers that appear from spring to summer add colour to the garden. From Western Australia this is a species that requires very good drainage and a sunny position. It does not grow well in humid conditions or wet/boggy soils. Prune away the old spent flower heads to tidy up the clump. Height – Around .5 metres in flower. Spread – Around .2 metres, however will form a clump to around .8 metres. Flowers – Bright Yellow flower buds opening to near white flowers.